... 1885, Karen Dinesen was born in Rungsted, Denmark, to a writer-soldier father of aristocratic background and a mother from a merchant family. Educated at home and abroad, she began writing fiction in her 20s. In 1914, Baroness Karen von Blixen (right) moved with her new husband (a Swedish baron who was also her 2d cousin) to Kenya, where they started a coffee plantation. 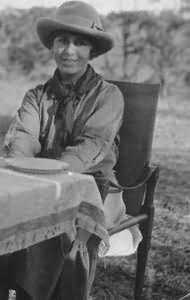 (credit for 1918 photo made on safari) In Kenya, she led the life that readers would come to know after the by-then-divorced von Blixen returned to Denmark and resumed writing, in English. In 1937, using the pseudonym Isak Dinesen, she published her best-known work, the beautifully written Out of Africa, made into a Hollywood film in 1985. In 1962, Blixen/Dinesen died at the estate where she'd been born 77 years earlier.